It’s not surprising that women feel less than competent when it comes to financial matters. The banking and investment industry, until all too recently, actively discriminated against women and discouraged their involvement with financial matters. Until the Equal Credit Opportunity Act was passed in 1974, women were not able to apply for credit. In the 1960s, lenders could refuse to issue a credit card to an unmarried woman. A woman applying for a credit card would be asked personal questions like: Are you married? Do you plan to have children? Many banks required single, divorced or widowed women to bring a man along with them to cosign for a credit card. It wasn’t until 1988 that the Women’s Business Ownership Act put an end to state laws that required women to have male relatives sign business loans. In light of these systemic practices to limit a woman’s access to financial resources, it’s understandable that women feel that they don’t know enough about investing to actively participate. Only 55% of the women interviewed felt confident about making financial decisions, compared with 79% of the men. Though a large percentage handle the day-to-day household finances, 56% of women leave the larger investment decisions to their spouses. All of this flies in the face of actuarial data that confirms that women tend to live longer than men. Eight out of ten women will end up alone during their lifetime, either due to divorce or widowhood. Given these facts, it’s shocking that 80% of women, from every generation, are OK seceding control to someone else. Finding themselves solely responsible for understanding investment options and making financial decisions, especially during a stressful time like a divorce or death of their spouse, can mean that these women struggle to manage. Not knowing the details of investments or estate planning can mean some unwelcome surprises like outdated wills, hidden debts or a distressed financial state. The good news is that it’s not too late for women to become involved in understanding and actively participating in their financial lives. Nearly all of the women who experienced divorce or became a widow said they would encourage other women to take steps now to educate themselves about finances and take an active role in making decisions that will have a great impact on their futures. At River Wealth Advisors, when working with married couples, we encourage both spouses to be informed and involved with the financial planning process. Having input from both helps us to refine the personalized financial strategies that will guide them through the changing currents of their lives. We can also assist women who suddenly find themselves faced with making major financial decisions, but have limited experience with investment matters. 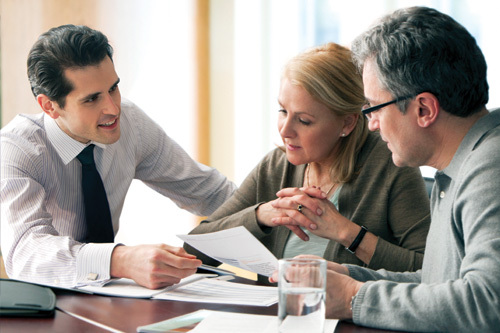 River Wealth Advisors can provide portfolio management and guidance on major financial decisions. We work closely with our clients' attorneys and accountants to assure that their lifestyle can remain intact.